Mold in buildings isn’t a new problem. However, it seems that we increasingly hear about it—sometimes even on the news. Why should we care? There are several reasons. 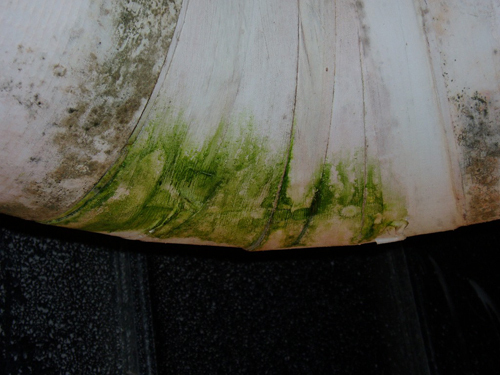 Mold is not only unsightly; it can deteriorate the building materials on which it grows. It also poses a health threat to people in the occupied space. Some types of mold are worse than others from a health point of view, but all mold in buildings is highly undesirable and, left to fester, often results in costly lawsuits. Four hurricanes hit Florida during the summer and fall of 2004: Charley, Frances, Ivan, and Jeanne. They caused $50 billion in damage in that state alone, much of which was related to mold growth in thousands of homes and commercial buildings. The high winds ripped off roof shingles and broke windows, allowing rain to soak walls and floors, and there was no power for air conditioning systems and fans to dry the buildings out. When the paper facing on drywall becomes wet and stays wet, it is a great food source for mold. There were reports of mold within 2 days after the hurricanes. Florida’s hot and humid climate greatly aggravated the situation, making it more difficult to dry the building materials. Another example: When Enron Corporation went bankrupt in late 2001, it stopped paying the utility bills for its Houston headquarters and basically turned the building keys over to the courts. Several years later, when Chevron Corporation purchased the building, it was reportedly covered with mold throughout its interior, particularly the walls. The walls weren?t wet; sustained high humidity combined with cellulosic building materials (such as paper facing on drywall) resulted in extensive mold growth. And, of course, Houston has more than 2,000 hours a year with relative humidity (RH) greater than 90 percent and an American Society of Heating, Refrigerating, and Air-Conditioning Engineers (ASHRAE) design dew point temperature of 79°F. Another source of severe mold problems that many builders in the Southeast—in the ASHRAE-defined hot and humid climate zone—have learned the hard way is using vinyl wallpaper on exterior walls. Vinyl wallpaper has a very low water vapor permeance, making it an effective vapor retarder, and the inside surface of a wall is the wrong side for the vapor retarder in a hot and humid climate. With the building’s interior temperature controlled to something like 75°F and the outdoor dew point exceeding 75°F for hundreds of hours per year, high humidity and even condensation existed between the vinyl wallpaper and the drywall surface to which it is adhered. With the paper drywall surface and moisture to feed on, the mold spores, always present in the air, thrive. Many other situations can lead to mold in buildings, such as water leaks from pipes in wall cavities; air conditioning ducts running through unconditioned, vented attics with insufficient duct insulation to prevent surface condensation; and similar situations with unconditioned, vented crawl spaces. 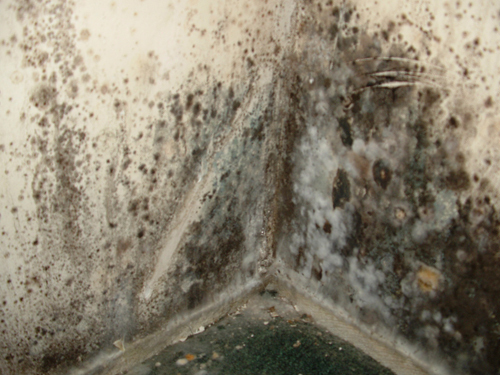 The type of mold most common in buildings, where paper or wood may be present, is stachybotrys chartarum. Mold spores are always in the air. Moisture can be either high humidity (greater than 80 percent) or water, although mold grows more quickly when water is present. Airborne dust that has settled on a surface can also support mold growth (this author has seen mold on the aluminum siding of a building, a consequence of dust collecting on the surface over many years). Among building materials, paper and wood are the most common sources of food; paper is easier for mold to digest. Another curious aspect of mold is that once started, it attracts moisture from the air and makes the mold-growing surface even more moist, further fostering its growth. Since mold requires either high humidity or water to grow, it is unlikely to be a problem in a continuously conditioned (i.e., continuously dehumidified) building with a good roof, leak-free plumbing, and a sealed envelope. The problems arise when moisture gets into a building as high humidity and/or water for an extended period. Leaks in roofs or plumbing can introduce sufficient moisture for mold to grow in either a building under construction or an existing building. A building under construction can be a victim of mold if construction materials stored outside are not correctly covered and become wet. Another concern for a building under construction is high humidity. If temporary dehumidified air is not provided and the HVAC system is not yet fully operational, then entryways, staircase doors, etc., that are open to the outdoors can allow humid outdoor air into the building. After construction is complete, there is a threat of mold if the air conditioning and dehumidification is shut off for extended periods (a colleague calls this “the idle building syndrome”). The ASHRAE Design Guide for Buildings in Hot & Humid Climates recommends that buildings in these climatic zones be dehumidified to a dew point temperature less than 55°F at all times, even if the indoor air temperature is allowed to drift upward during unoccupied periods to save energy. For buildings under construction, the ASHRAE guide recommends that the permanent HVAC system not be used for dehumidification, since the system is not designed to do this under construction conditions. Instead, it strongly recommends the use of temporary dehumidification equipment to remove moisture from the building interior and maintain a low dew point temperature. Drywall with untreated paper facing is the most common source of food for mold in buildings. Drywall is available with paper treated with a fungicide that can protect against mold growth; however, even drywall faced with treated paper is likely to eventually grow mold if wet and warm for an extended period. This is a much greater threat in a hot and humid climate because of the time factor: building materials, once they become wet, are more likely to remain that way. Thermal insulation materials used for mechanical insulation do not support mold growth. Mold cannot feed off fiberglass, mineral wool, flexible elastomeric, cellular glass, or any plastic foam insulation materials. However, when paper is used in a facing, such as kraft paper in conventional all service jacket (ASJ) or foil scrim kraft (FSK), it can be a source of food for mold. These two products are treated with a fungicide to discourage microbiological growth, and this treatment is, to the best of this author’s knowledge, successful in preventing mold growth under high humidity conditions, even when sustained for a long period. However, if treated kraft paper becomes wet and stays wet for an extended period, it will grow mold. If used to insulate either chilled air ducts or chilled water pipes under sustained high humidity conditions, it will likely not dry out. If fiberglass boards with FSK (a laminate of aluminum foil, glass fiber scrim, and kraft paper) get wet during construction, they should be discarded and replaced. The risk of mold is too great to use them, and wet materials don?t insulate well. On outdoor ducts, it is very important that an insulation system with FSK facing be covered with an outdoor jacket system that is continuously and tightly sealed against water and vapor intrusion to keep the FSK, and the insulation, dry. 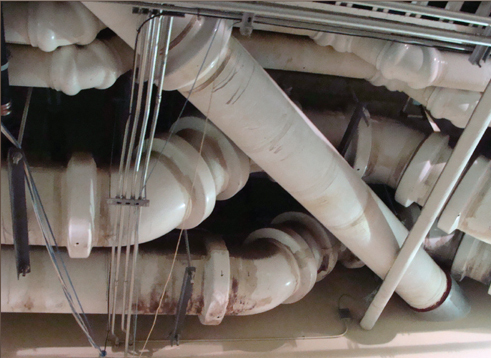 Conventional ASJ (a laminate of white kraft paper, glass fiber scrim, thin aluminum foil, and a thin plastic film) used as a facing on chilled water pipe insulation will also support mold growth when it becomes and remains soaking wet from surface condensation. This can happen for various reasons, including its use in an unconditioned space in a hot and humid climate. In an unconditioned space, the RH is high much of the time. 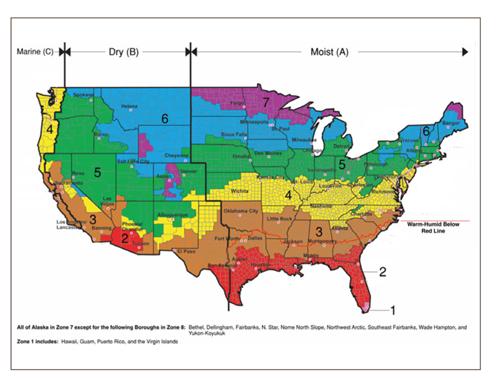 In a construction environment, with the additional release of moisture from curing concrete and drying spackling and paint, the indoor humidity can become even greater. Usually, design conditions for insulation thickness selection in an unconditioned space are specified as 80 percent or 90 percent RH. When the RH exceeds those conditions, condensation will probably occur on pipe insulation, and it will soak into the ASJ’s kraft paper exterior surface. With the chilled water flowing continuously through the insulated pipe, the kraft paper does not dry out for a long time, perhaps as long as 9 months for hot and humid places. (as shown in the study performed a decade ago for NAIMA by John Mumaw1). “Note that ASJs may have service limitations on below-ambient systems in wet environments. Condensation on the surface (possibly caused by inadequate insulation thickness), or moisture migration under the ASJ (through breaches or holes), or liquid or water (from an outside source) can degrade the ASJ by mold growth on the paper and/or corrosion of the aluminum vapor retarder component…. To avoid mold growth in buildings, the best practice is to prevent water leakage into the building and to keep it dehumidified to a dew point temperature less than 55°F at all times. If leaks do occur or the dehumidification system becomes inoperative, it is important to correct the problem(s) as soon as possible and dry the building and the materials inside. A mold problem should not be allowed to fester, since it will invariably become worse. This is particularly critical when the building is in a hot and humid climate and the space is unconditioned. 1. Mumaw, John, “Below Ambient Piping Insulation Systems,” Insulation Outlook, September 2001. Goldschmidt, Michael, “Managing household mold,” University of Missouri Extension, June 19, 2009. ASHRAE Standard 90.1-2007, Energy Standard for Buildings Except Low-Rise Residential Buildings. Harriman, Lewis G., and Lstiburek, Joseph W., The ASHRAE Design Guide for Buildings in Hot & Humid Climates, Second Edition, 2009.